Set in gold and silver and dating from latter half of the 1800s, it includes small diamond designs between five large scrolling diamond elements, each with a sapphire at the center. The sapphires can be swapped out for turquoise stones. 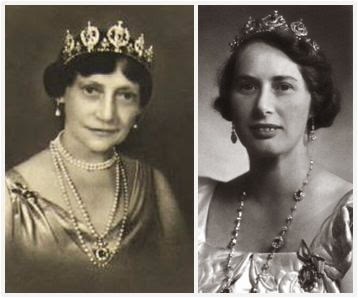 The tiara belonged to Princess Thyra of Denmark (1880-1945), who was the daughter of King Frederik VIII and Queen Louise. Thyra never married and had no children, and she left the tiara to her niece, Princess Caroline-Mathilde of Denmark (1912-1995). Caroline-Mathilde was married to Knud, Hereditary Prince of Denmark, the second son of King Christian X and Queen Alexandrine. (Had history gone differently, Knud could have been the King of Denmark one day. He was next in line to his older brother, Frederik IX, who had only daughters at a time when women couldn't inherit the throne. But the law was changed in 1953, and a young future Queen Margrethe and her sisters jumped ahead of him in line.) 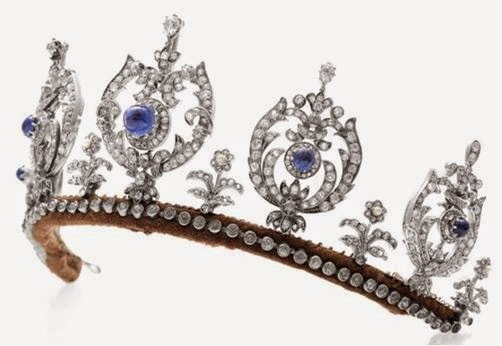 The couple had three children, and this tiara went to their only daughter, Princess Elisabeth. Princess Elisabeth is still in the line of succession for the Danish throne, and she sometimes attends official engagements. When a tiara is required, this is her constant favorite. It really does remind you of a blue version of the Edward VII Ruby Tiara in Sweden, doesn't it? Princess Thyra's Sapphire Tiara has a lower profile and five larger elements instead of three, so it feels a little more balanced. It also seems easier to wear with a modern hairstyle (the Swedish ruby is truly made for the large Edwardian 'dos popular when it was created), although when worn tilted back (as it is above), it can practically disappear. Nevertheless, I'm always happy to see Princess Elisabeth out and about and to see this one in action. Where does this rank on your list of favorite sapphire tiaras?